It is with GRAND excitement that I share the GRANDest news of all! Our son, Jake, and Daughter-in-Law, Colleen are expecting a baby! Which means hubby and I are rocking into GRANDparenthood! We could not be more GRANDly excited and happy! You may remember my bestie Jill’s daughter just had a baby a month ago – the first McHendy GRANDbaby…. 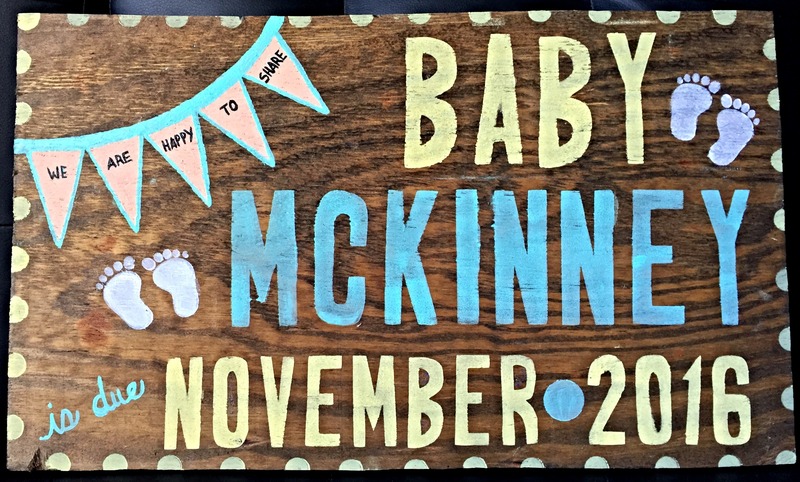 Well – now Baby Ben is going to have a McHendy GRAND brother or sister! 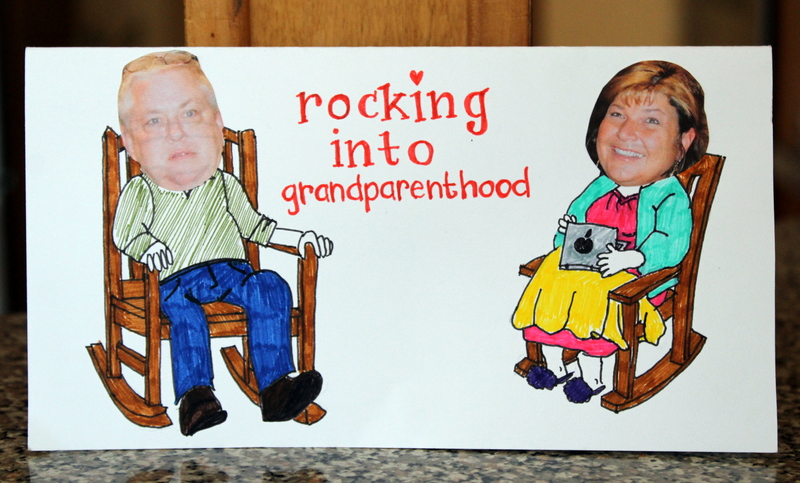 And Jill made this GRAND rockin’ card, which she and Todd gave to Marty and I this weekend to go with a GRAND rocking chair for our front porch to rock our new GRANDbaby! So if you haven’t figured out, I am GRANDly excited! My Grandma was the greatest role model in my life, and I feel she has prepared me to be a GRAND Grandma. 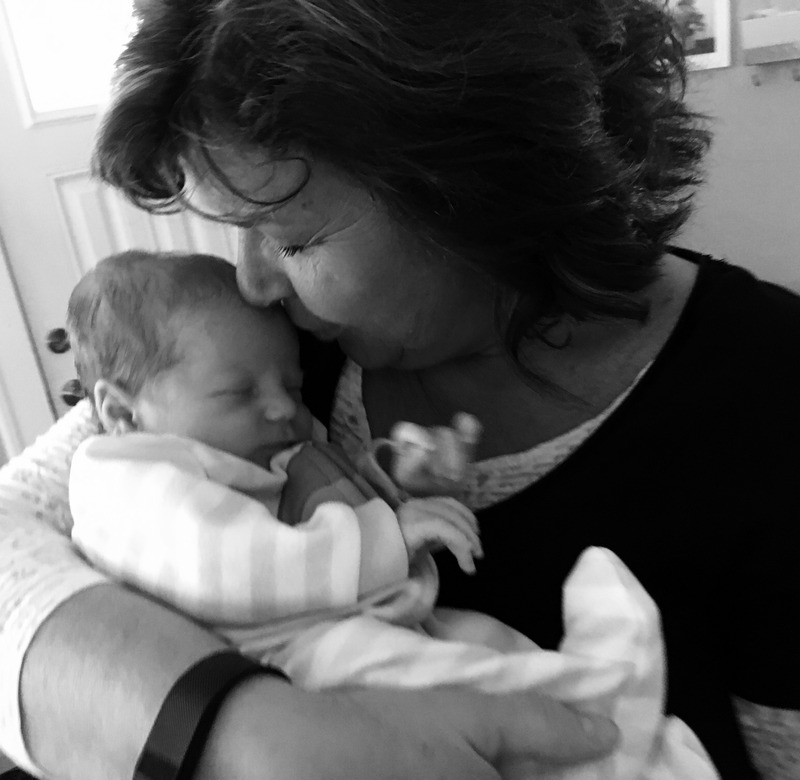 If I can be only a fraction to our new GRANDbaby of what she was to me, it will be my GRANDest honor. Congratulations! Looking forward to many wonderful stories about this GRANDparent journey! The absolute loveliest! 🙂 Thanks Catherine! I am GRANDly happy for you!! 🙂 and here because of my text to you I knew before it became public 🙂 What timing! LOL! I am sure that you both will make wonderful grandparents!!! 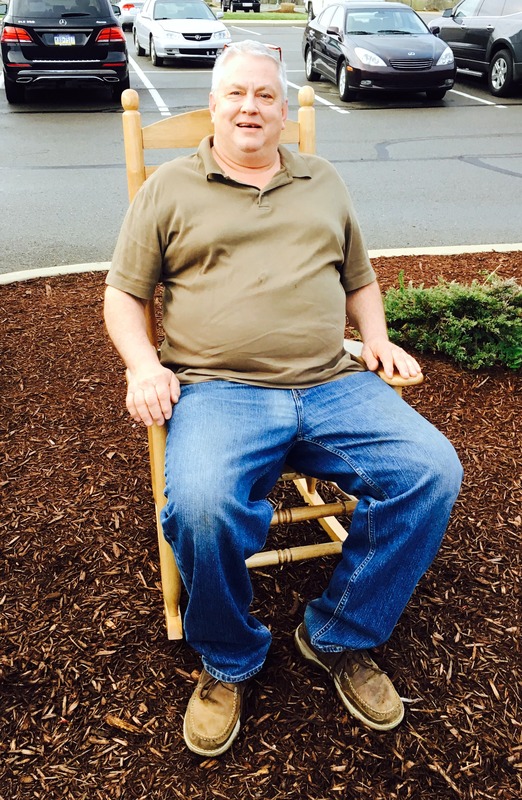 What a perfect gift with the rocking chair! I loved rocking my babies! Cheers and hugs to you today!!!!!!! CONGRATULATIONS! I know how excited you must be because you have been looking forward to being a grandparent! You and Marty will make the BESTEST grandparents! LOL! I truly am happy for you!! So excited to hear about your GRAND announcement! You guys will be awesome grandparents! That is wonderful news Jodi! Congratulations!! Honestly, I often think that I will make a better grandparent than parent. It just seems like it has the potential to be an absolutely awesome experience. I’m positive that with your great relationship between your family, it will be wonderful. Me too! Less worried. More confidence. Cannot wait!!!! Happy Happy Joy Joy! That is wonderful news! 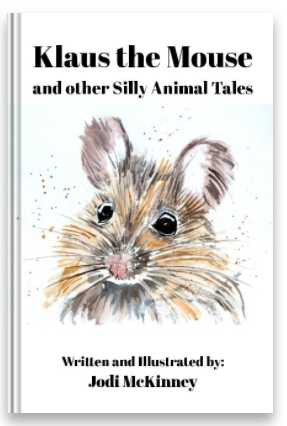 Oh Charlie – can you even imagine how giddy with excitement I am??!! I am about bursting out of my skin! I cannot wait! And you must put a rocking chair on your christmas list. Surely you have started it already! LOL! What great news, Jodi!!! 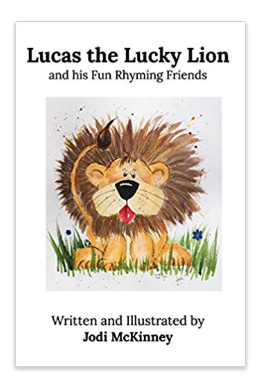 You will be an amazing Grandmother and have so much fun sharing your creativity with him/her. This is such a fun time for you and your family. God bless all of you, especially that new little one. Awh! 🙂 I know the feeling!! thanks so much my friend! Such exciting news! Congratulations!!! I know the feeling and it is truly the best. Our two year old grandson has a sibling growing in our daughter. He doesn’t quite get it, but the rest of us know we get a new baby to love and hold in mid October. I love the rocking chair idea and the card you got! VERY creative! thanks so much Kerry and congrats to YOU too!! This is the best news ever, Jodi. You are going to be the best gma! I’d better get my needles out and make a ” Sharony” sweater for the little one. I’m so happy for your family! What wonderful news Jodi! Congrats to all of you! YEAH YEAH YEAH! Congratulations YEAH! Thanks so much Joanne !!!! Excited beyond excited!!! Congratulations to you and the parents to be! It’s wonderful being a Grandma. I’m sure you’ll be a wonderful Grandmother! I love this Grand announcement and you will be a GRAND Grandma and GRAND Grandpap!!! Grandma will be pleased and smiling brightly as she looks over you each!!! Such a sweet gift from The Hendersons too!!! Congratulations everyone!! I love you all!! Awh Shucks! Thanks so Much Sissh! Congrats Jodi! It’s a whole new world!! Thanks Debi!!!!! 🙂 Can’t wait to do all of those things! I bet you’ll be doing what I did…. running out asap!, and buying baby stuff with glee!! I can’t imagine!!! ❤ ❤ <3!!! hehe, just don’t tell my girl that lol! 😀 I think she may change her mind in time….. 🙂 Until then, we shall live vicariously through your GRANDness! The best possible news! Wonderful. Congratulations. Wonderful news! Congratulations to you and your whole family on this wonderful new phase of your life. You are going to have so much fun with that new grand baby!!!! Congratulations to the whole family, Jodi. I have no doubt you’ll be a GRAND grandma. What GRAND adventures lie ahead!! Congratulations! You two will have so much fun! So happy for you! So very happy for you and your family!! Congratulations, Grandma! You are already doing a GRAND job loving that baby! 🙂 Thanks so much Gina!! !